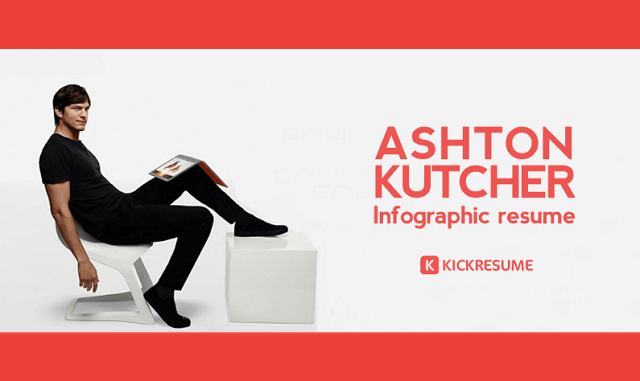 Ashton Kutcher’s Resume #infographic ~ Visualistan '+g+"
Do you admire Elon Musk or Steve Jobs for their visionary undertakings? What if I told you that Michael Kelso from That 70s Show is easily their equal? If you still see Ashton Kutcher only as a dopey hunk from Dude, Where’s My Car?, you’re way behind the times. Over the years, Kutcher has quietly built a media empire. He also co-founded a human rights organization. Finally, he became famous for investing in tech companies such as Skype, Uber, Spotify, and Airbnb. In six years, he turned his $30 million fund into a $250 million, which is really incredible. In the world of venture capital, if you can generate return 3x, you’re already considered one of the best. Kutcher was able to return 8.5x. Not bad for someone who became famous by playing stupid!